A sweeping fantasy epic that combines magic and mysticism with space exploration and high drama, set amid a primal struggle between Darkness and Light. In the beginning, there was only Darkness, until Light came out of it, and from Light came Life. 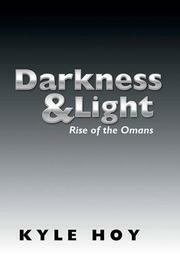 Eventually, the Omans—living beings that merged with the Light itself—arose to fight the Darkness. The greatest and wisest of them is Auron, their king. To save his people, he must leave the safety of Sonos, their home, and carry the Light into outer space to ignite new stars and new life. The Omans create ships and choose teams, whose members include the loyal Merek, the brilliant Raja and Relix, and many others with useful talents. But the Darkness has its own agents, hollowed-out shells of living beings led by the dread General Fazon. Auron will face this opposition, the unknown dangers of space, and possibly betrayal during his quest to bring new Light and life to the dark matter of the universe. The question is: does he have what it takes to see his mission through to the end? Unfortunately, the characterization in this tale doesn’t shine. Every person is uncomplicated, with clear motivations and little in the way of inner lives or emotional conflicts. This problem is only exacerbated by the often wooden dialogue and an emphasis on worldbuilding over character development. The world that Hoy has created, however, is primal, imaginative, and mythic, and readers will find it fascinating to explore. This is especially true when the action shifts from fantastic to technological elements. Sadly, when the story comes to an end, it’s so abrupt that it’s more jarring than satisfying. A bold myth with solid worldbuilding, hampered by weak characters and a conclusion that’s more like likely to irritate than tantalize readers.